I’ve updated the chart of EUAs vs crude oil (see below). I’ve included some comments based on an incomplete understanding of the dynamic between the two, so any comments would be gratefully received. For the past year, EUAs have been rangebound between 12 and 16 euros. Oil, conversely, has trended strongly upward from $63 (EUR45) a year ago to a high of $80 (EUR63) a week ago. 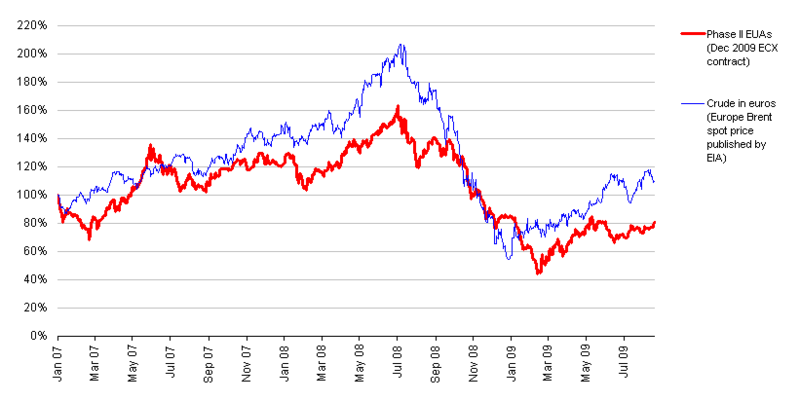 This is in contrast to the first period shown on the graph, between Jan 2007 and Spring 2009, where EUAs and crude were strongly correlated. The relationship between EUAs and crude oil is partly that both are driven by overall demand for energy, but this changes over the long-term. The relationship observable in this graph is more likely driven by the ‘dark-spark’ mix of energy production in Europe. This refers to the mix of coal (dark) and gas (spark) in energy generation. Oil prices tend to drive the price of natural gas, which is clean relative to coal. When oil increases in price, energy generators switch to coal and therefore demand for carbon credits increases. The increase in oil price over the past year would usually indicate a greater proportion of coal going into Europe’s energy supply. However, higher demand for carbon credits has not resulted. The sluggishness of EUAs in responding to oil prices is probably a reflection of poor industrial recovery following the credit crunch. At Carbon Retirement, we have just published a short piece of research into the efficiency of carbon offsetting through the Clean Development Mechanism, covered today by the BBC. It shows that for every £1 spent on CERs by voluntary buyers, 28p goes to the project’s capital expenditure and maintenance costs. The chart below, from the report, summarises the costs per CER, with the grey chunks representing project expenditure. Project costs total £3.78 per CER, or 28% of the price paid by the final buyer. This isn’t a study of profitability for any of these actors and the costs at each stage might be reasonable. The big chunk taken by the pCER buyer in our model, for example, may be a fair reflection of the risk it holds that the project will not deliver CERs. However, the research shows that the efficiency of the overall system is very poor. While some transactional costs are inevitable and you could never expect 100% of your money to go to project funding, 28% seems far too low. Imagine if a development charity told you that 72% of your donation went to middlemen and admin fees! Co-incidentally, 28% is also the proportion of UK national lottery revenue that goes to charity. So, buying carbon offsets to mitigate climate change is like buying lottery tickets to give money to charity. With carbon offsetting, you don’t even win a prize! I just read the new report on carbon trading (pdf) from Friends of the Earth. Given the charity’s stance on anything related to carbon trading, the critical approach is unsurprising. The report makes some good points, but also makes some points that don’t seem well thought out. This is a shame because the charity could achieve much more by taking a reasoned position in the debate and focusing on the things that need changing. 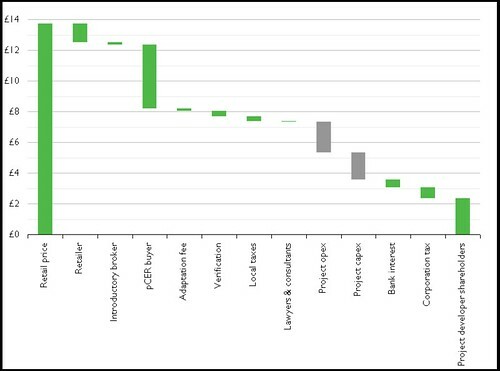 The EU ETS scheme has clearly failed to provide adequate incentives for European firms to reduce their emissions in Phase I; Phase II is performing poorly and is likely to fail. The complexity of the carbon markets, and the involvement of financial speculators and complex financial products, carries a risk that carbon trading will develop into a speculative commodity bubble that could provoke a global financial failure similar in scale and nature to that brought about by the recent subprime mortgage crisis. That’s not a good comparison. There is a lot of derivative trading in the EU ETS but we know exactly what the underlying asset is. The derivatives are simply tools to make trading smoother. The idea that carbon markets are a ponzi scheme run by speculators runs through the report, and some errors are made, including that most carbon credits are held by speculators (they aren’t; most credits are held by statutory market participants). Polluters have an incentive to make extra emission reductions under emissions trading so that they can sell credits, therefore, emissions trading stimulates innovation. This model accurately explains the situation of sellers of credits. […But it ignores the buyers…] Carbon trading makes lower-cost credits available to these firms as an alternative to the higher-cost investments that they would otherwise have to make. Hence trading removes any incentive that they have for technological innovation. This would be better explained as “cap and trade makes equally valuable emission reductions for less money”. developed countries are using the prospect of increased carbon market finance to hide from their commitments under the United Nations Framework Convention on Climate Change (UNFCCC) to provide new and additional sources of finance to developing countries. Carbon market finance comes from offsetting developed-country emissions cuts which should be additional. Counting it towards the financial commitments of developed countries is double counting. This is right. And the report makes a generally fair rehearsal of all the usual issues with offsetting and the CDM. If the parties to the UNFCCC can turn the screw on carbon markets, by (a) using the cap to demonstrate greater commitment to more ambitious reductions and (b) cutting out offsetting, then carbon markets like the EU ETS can be an effective central tool in mitigation. There is no reason why cap and trade should exclude direct support for low carbon technologies where governments feel help is needed. It’s not practical to ask the UNFCCC to throw out carbon markets, and I would like to see FoE take only its reasonable points to the negotiations. Does the government need to provide guidance on the term ‘carbon neutral’? Carbon neutral means that – through a transparent process of calculating emissions, reducing those emissions and offsetting residual emissions – net carbon emissions equal zero. The government is repeating the general mantra that carbon offsetting must be the last step in carbon management, following measurement and internal reduction. I have always found this view a bit simplistic and also feel the government is sticking its oar in too far by giving a hard line in an area of voluntary corporate responsibility. There is no similar guidance for corporate foundations regarding which charities they should support, for example. For most organisations, it is not clear what ‘residual’ emissions are. At some point the cost of internal abatement reaches an unbearable level and offsetting makes more sense. But this point is not obvious for any organisation. Very few have a full breakdown of the environmental projects available to them and the cost per tonne of each project. And even if they did, they would be unlikely to be able to decide on the threshold for which projects are affordable – particularly if they cannot compare internal projects with carbon offsets on the same terms (because internal projects should be prioritised). The carbon offsetting industry supports a strict ‘measure-reduce-offset’ hierarchy because it is regularly accused of creating the moral hazard that it’s OK to keep on polluting. A self confident offsetting industry – an industry that believes its credits have environmental value – would position offsets as a legitimate tool that can be weighed against internal reductions. Having made those criticisms, I would strongly advise any company wishing to claim it is ‘carbon neutral’ to follow DECC’s guidance. There is no point saying you are carbon neutral if you are going to be shot down by campaigners or switched on customers who believe you are making unsubstantiated claims. Following the guidance at least means you can point to a common methodology. Even better, avoid the term carbon neutral altogether. I’ve developed a game that explains the differences between three key policy options for reducing emissions: command and control, tax and cap-and-trade. There are other games like it, but I think this one works really well and we like to use it with clients to explain the rationale behind the current preference that many governments have for cap-and-trade policies. Up to six participants (or six teams of two or three) are cast as the CEOs of large, carbon-intensive companies. They have asked their business analysts to prepare reports on how they can reduce their carbon emissions. These reports are shown at the top of each worksheet (you can download the worksheets here). Each company can implement two projects. You don’t have to implement an entire project – you can do half of it for the half the cost. The facilitator (who is cast as the government), then asks each company to work out how much it will cost them to meet emission reductions under a command and control regime (i.e. you must meet the reduction target, and you can only implement your own projects). The facilitator asks each company to report how much money they spent and the emission reductions they achieved, and writes totals up on a flipchart. Next, a tax regime is used. Each company will be charged £40 for every tonne of carbon that they miss their target by. Again, they report the results. Finally a cap-and-trade scheme is used. Each company decides how many credits they would buy or sell at four price points (using auction ‘order books’, which you can download here). The data is fed into a spreadsheet that works out the optimal clearing price and shows who buys and who sells (the spreadsheet is available here). It’s called a French auction and it’s just like real carbon markets. Cap-and-trade is cost efficient and achieves the desired reductions. The game involves huge simplifications, of course, but does outline some basic economics behind these policy choices. Is carbon still following oil? 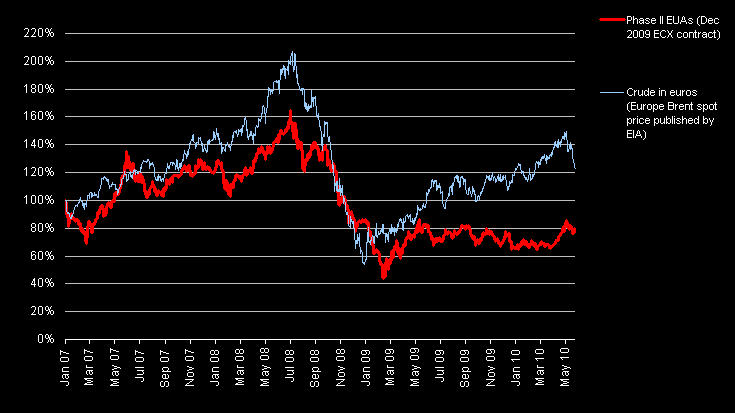 In January I looked at European oil and carbon prices to show how they were reacting to the economic recession. Today I had another look at these two markets to see what’s happened over the past six months. The graph below (click to expand) shows the December 2009 EUA contract (from ECX) and the Europe Brent spot price (from the Energy Information Adminstration, converted in Euros using currency data from OAndA). The prices have been indexed to January 2007. Historically, carbon has largely followed oil. In 2009 the trend seems unclear. While daily trading news is full of headlines like “carbon nudges higher on strong energy complex”, carbon seems have recovered less than oil. In January 2009, the nominal prices of oil and carbon were both around 70% of January 2007. At the end of last week, oil was at 110%, while carbon was at 80%. I don’t have any clear commentary to offer just now. Glancing at the graph, it looks like carbon has fallen behind oil by about three weeks, but that doesn’t feel like a very plausible theory. I’d be interested to hear any thoughts. Why does carbon offsetting struggle with its reputation? Carbon offsetting has a reputation problem. Some parts of the ‘carbon’ industry act dishonestly or are not environmentally motivated, and people outside the industry tend to lump the diverse organisations involved in carbon trading together. When an exposé story appears in the media, we all suffer. This week there was a story about suspected VAT fraud in carbon markets. Dodgy brokers were buying carbon credits abroad (which does not attract VAT), and then selling them in the UK and applying VAT. They are thought to have made £38m. It’s called carousel fraud or ‘missing trader’ fraud (because the broker disappears with the tax). One funny thing about this story is that none of the coverage says which market the fraud was in. Were these CDM credits (the carbon offsets that the UN allows governments to use)? Twitter was full of people saying that this story confirmed carbon trading to be a con. Several newspapers referred to “so-called carbon credits”. Why “so-called”? Another example is the campaigns by NGOs like Friends of the Earth and WWF against the use of offsets in statutory carbon trading schemes. Under the Kyoto Protocol, governments of rich countries can offset some of their emissions by funding projects in the developing world. The NGOs feel this allows them to wriggle out of their responsibilities. Dangerous climate change will be unavoidable if the UK, EU and USA succeed in increasing the use of carbon offsetting, Friends of the Earth is warning in a new report released today [Tuesday 2 June 2009] that exposes carbon offsetting as ineffective and damaging. The problem with carbon offsetting is that at best it robs Peter to pay Paul – with no net benefit for the planet. All too often, offsetting is simply used to justify business-as-usual behaviour in the UK and other countries. These charities are referring to the CDM or whatever succeeds it when the Kyoto Protocol expires in 2012. While both have misgivings about voluntary carbon offsetting, neither would object to its use by a company or individual who is doing all they can to reduce their own footprint. Unfortunately most people are not aware of the difference between voluntary and statutory carbon markets and articles like the above cast the whole sector in a poor light. The challenge for organisations involved in carbon trading is to help their market understand what happens to their money. No customer can be expected to spend their money if they believe it will be appropriated by fraudsters. I am a business consultant based in London. My main interests are carbon markets and corporate environmental responsibility. If you'd like to contact me, go to my contact form. Carbon Retirement is a new offsetting service that lets you directly influence the level of industrial emission in Europe by permanently retiring EU Emission Allowances.